As with all previous books in the series Turn Coat does not disappoint. It is action packed from start to finish. The story picks up with the Warden Morgan coming to Harry for aide. Morgan has been accused of a most grievous crime. The murder of a senior white council member. As is typical Dresden style he comes to Morgan's aide, because Harry loves lost causes and thinks that no matter what what's right is right. It is a rocky journey for Harry. Possibly the hardest of the series so far as Butcher attempts to throw bigger and harder curve balls at Harry to keep him on his toes. Turn Coat mostly has to deal with The Black Council story line that has been ongoing for sometime along with the White Council. That plot thread is advanced quite a bit as more people are brought into the fray of the Black Councils plans. Harry is battered by all sides from NeverNever zombies to a Skinwalker all while trying to avoid the other Wardens who are searching for the rogue Morgan. Butcher's treatment of the Skinwalker was the best use of the Native American mythology I've ever seen. The Skinwalker is the most formidable creature Harry has faced so far. Harry's connection to the mysterious island is also made stronger as he delves into its secrets. Thomas seemed a bit lost in the story, but he has for a few books. Without spoiling all I can say is Thomas is a different man (or monster) by the end of the book. Turn Coat also sees the development and testing of Harry's young and nubile apprentice Molly. Molly has to learn to use her ever-strengthening skills more and more, but her dark past comes back to haunt her. My favorite parts of the last few books has been Dresden's growing interaction with the White Council. Turn Coat sees Harry visiting White Council HQ which only intrigued me more about their history and true strength. We finally get to see some of the Senior Council member show their true strength. Injun Joe is amazing impressive so it makes we wonder what The Merlin could do since he is supposedly the most powerful. Also, a few small tidbits come up about Ebenezer's history and duty for the White Council, which will hopefully be expounded upon in future books. All in all Turn Coat is a great read and advances Dresden's world more. That said there are still dozens of plot lines up in the air such as the swords and who else is on the Black Council. 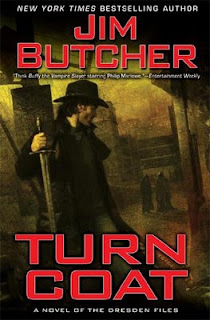 I have great hope that Butcher can keep up the action and intrigue for the remaining books. I give Turn Coat 9 out of 10 hats. Nice review and I agree on all points. Though I'm curious, did you spot the "bad guy" early or was it a surprise right up until the end? I definitely called the bad guy as soon as you meet them. They were the only person that made sense. I kept hoping Butcher was going to try to reveal someone else, such as an already established council member. That's my only gripe with the book though.